The Commonwealth of the 'Taula del Sénia' (M-TdS) is a local entity made up of 27 municipalities (15 in Valencia: Benicarló, Càlig, Canet lo Roig, Castell de Cabres, Cervera del Maestre, Herbés, La Jana, Morella, La Pobla de Benifassà, Rossell, San Rafael del Río, Sant Jordi/San Jorge, Traiguera, Vallibona and Vinaròs), (9 in Catalonia: Alcanar, Freginals, La Galera, Godall, Mas de Barberans, Sant Carles de la Ràpita, Santa Bàrbara, La Sénia and Ulldecona) (and 3 in Aragon: Beseit, Pena-roja de Tastavins and Vall de Roures), situated along the River Senia and the Ports Mountain Range, with a total of more than 111,000 inhabitants. Their town mayors belong to different political parties: Socialists, PP, CiU, ERC, Podemos, IpC, Compromís and PAR. Despite they are three different neighbouring autonomous regions, these towns and their inhabitants have lots in common in a variety of ways. On the one hand, the geography, the history (llercavons, Corona d'Aragó, Bisbat de Tortosa), the culture and the language are similar. However, unfortunately as well, their economic situation, youth emigration, and the ageing population are other characteristics in common; especially in land areas. Most definitely, the distance from the governing bodies, and a strong lack of infrastructures, has made this reality more pronounced. - and from them, achieve the necessary investments. 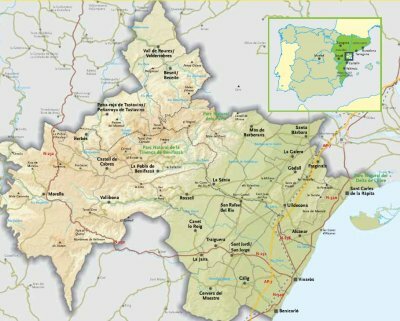 Even though there has always been a good relationship between the people on both sides of the River Sénia, the origin for what is now the Commonwealth set down in a meeting of the mayors from Vinarós, Alcanar, Ulldecona and La Sénia on 1st August 2003. After a long process (of more than 2 years), it was agreed that a commonwealth of municipalities should be formed and on 20th February 2006 it was inscribed in the Local Entities Register of the Ministry of Public Administrations with the number 0543014. Its strength is based on: looking for the maximum consensus amongst the towns, collaboration with all of the local administrations and cooperation with the economic and social sectors. The Commonwealth has impulsed the creation of Territori Sénia Association, consisting of 50% M-TdS and the other 50% of economic sectors in the area. It is this association that manages the Territori del Sénia Millennium Olive Trees and Oil project, that values this important live heritage, unique in the world. Regarding the Rei Jaume I Foundation, also impulsed by the M-Tds, half of the patrons are mayors and the other half representatives of the cultural and social world in the region. In function of the resources that it has at its a bast, it promotes activities above all in the smaller towns. The role of President is elected for one year. At present, it is Alfons Montserrat Esteller (The mayor of Alcanar) and the Vicepresidents are the mayors and deputy mayors in La Pobla de Benifassà, Morella, Càlig, Vinaròs, Canet lo Roig, Benicarló, Santa Bàrbara, La Sénia y Cervera del Maestre. The secretary of the commonwealth is Javier Cabanes and the manager is Mª Teresa Adell.